The well-known Filipino tour guide on the kilometer zero in the Philippines took his Facebook account and posted his sincere message to stop the hates and the threats thrown to him before and until the 2016 polls ends. Carlos Celdran says sorry. He become more sensational on social media when he choose to support the LP standard-bearer Mar Roxas and created the hashtag #Dutertards on Facebook, Twitter and Instagram to criticized the Duterte's supporters. But eventually, the tour guide decided to apologize to all affected Netizens specially to all Duterte's supporters to some reasons. Celdran admitted that he was tired enough from the issues between him and to the people who are always ready to fight for their bet. But then, to make a long story short, when the 2016 elections campaign started, he still continue what his doing to defend his presidential candidate Mar Roxas againts the Duterte's supporters. Until now! 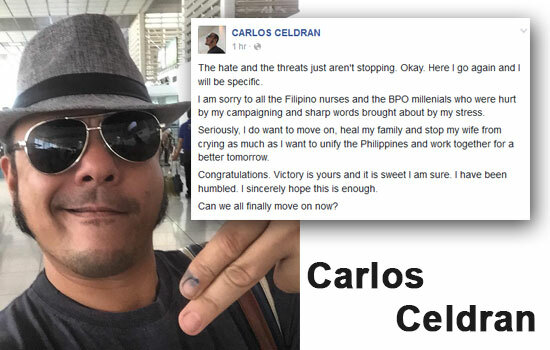 even the 2016 polls ends, Carlos still get hates and threats from other Netizens. And he wanted to stop it and reconciliate to all supporters of presumptive president Rodrigo Duterte. To all the ‪#‎Duterte‬ supporters who didn't get the message of reconciliation yesterday and still sending hate today, please read up. Thank you. "The Davao citizen who sent me sends an apology. He also calls for the hate to stop. Thank you, Michael Sia. :o) In this light, I apologize as well to all the #Duterte supporters who were hurt by my relentless campaigning." *Credit to Bogart the Explorer from Davao City for #PDiggy. After an hour of posting the said message above. Carlos created this FB status for all the solid supporters of Rodrigo Duterte, he says 'Sorry' and 'Congratulates' them. The hate and the threats just aren't stopping. Okay. Here I go again and I will be specific. I am sorry to all the Filipino nurses and the BPO millenials who were hurt by my campaigning and sharp words brought about by my stress. Seriously, I do want to move on, heal my family and stop my wife from crying as much as I want to unify the Philippines and work together for a better tomorrow. Congratulations. Victory is yours and it is sweet I am sure. I have been humbled. I sincerely hope this is enough. Can we all finally move on now? Why the hates and threats for Carlos never stop? Is he committed a very big sin to all Duterte's supporters? Please Point out your thoughts in the comment section below. Comments or suggestions about "Carlos Celdran says 'Sorry' and 'Congratulates Duterte's supporters'" is important to us, you may share it by using the comment box below.